This style carved wedding band features Flower design and milgrained edges. 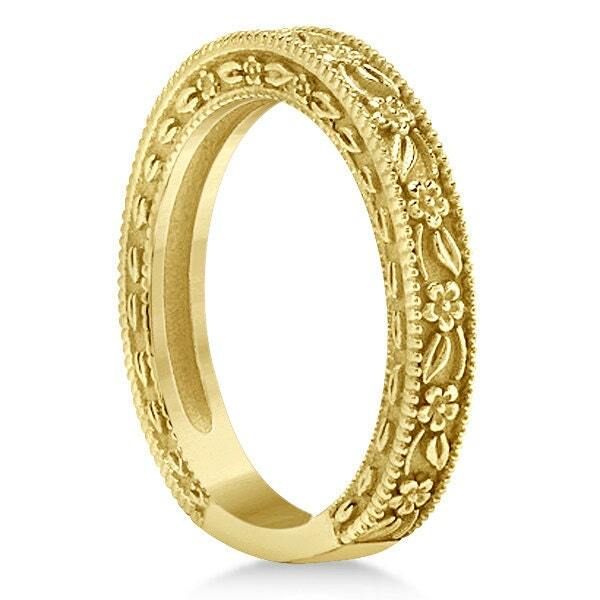 The ring is crafted in 14kt Yellow Gold.This ring is absolutely stunning and I am confident you will love it. Perfect for Weddings, Mothers Day, Birthdays, Valentines Day, Graduation, Christmas or just about any other occasion. It is also available in 14k rose and yellow gold. Other stones options also available. Please message for more detail. Thank you. The ring is perfect! My husband bought it to go below a band that was my Mother’s in memory of her and I love it. The detail is even better than what this picture shows. The forget me nots are so dainty. Such a perfect and unique wedding band. It's beautiful and special. I've never seen anything like it, I think the floral engraving gives it such an old world and romantic vibe. Gene is also a pleasure to do business with and very accommodating. This Is my Moms ring and she loves it! It's so beautiful! It's stunning and she couldn't be happier with it thank you. This ring is gorgeous and flawlessly made. Unfortunately, we had to return it because it did not work with the ring with which I planned to wear it. The seller was gracious in his communications about the return and has gone above and beyond our expectations. I recommend this seller without reservation and would definitely purchase from this store again.